Habit: Annual. Stem: 1--40 cm, spreading to erect. Leaf: basal 1--25 cm, blade < 4 cm, < 3 × longer than wide, elliptic to reniform, tip rounded to acute, petiole linear; cauline fused into < 10 cm diam, round, +- obtuse-angled, or +- square disk (or free on 1 side). Inflorescence: stalked or not, open or dense, 1-bracted at base; flowers 5--40. Flower: sepals 1.5--5 mm; petals 2--6 mm, white or +- pink. Fruit: 1.5--4 mm. Seed: 1.2--2.7 mm, ovate to round, shiny, smooth. Note: Highly variable; subspecies difficult because of environmental modification of character states, genetic mixing among polyploids, and geographic overlap of distinct, self-pollinated forms. Leaf: basal deltate to reniform, mucronate; cauline disk angles generally 2, generally short-pointed. Chromosomes: 2n=12,24. Ecology: Shrubland, woodland, rock crevices, rockslides; Elevation: 500--2000 m. Bioregional Distribution: NCoR, SnFrB, SCoR, TR, PR; Distribution Outside California: Arizona, Mexico, Central America. Flowering Time: Feb--Apr Note: Intergrades with Claytonia perfoliata subsp. perfoliata, Claytonia parviflora, Claytonia rubra. 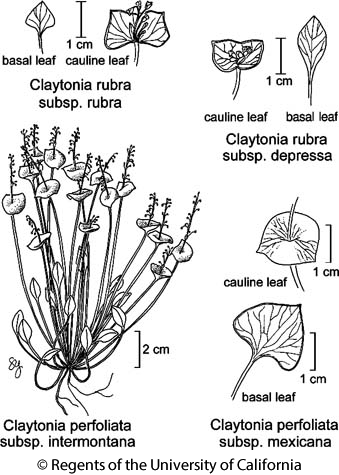 Citation for this treatment: John M. Miller & Kenton L. Chambers 2012, Claytonia perfoliata subsp. mexicana, in Jepson Flora Project (eds.) Jepson eFlora, http://ucjeps.berkeley.edu/eflora/eflora_display.php?tid=76956, accessed on April 20, 2019. NCoR, SnFrB, SCoR, TR, PR; Markers link to CCH specimen records. Yellow markers indicate records that may provide evidence for eFlora range revision or may have georeferencing or identification issues. Purple markers indicate specimens collected from a garden, greenhouse, or other non-wild location.